We judge fabrics instinctively with the touch of a hand. More than sight, the meeting of skin on fabric lets us know if something is quality or not. Touch reveals the unquantifiable presence of beauty. In the textile industry it's called "the fabric hand." 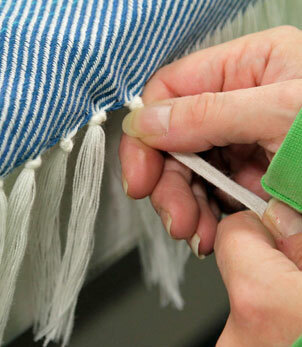 At Brahms Mount in Maine, it's always the hand that's immediately drawn to touch the blankets made exquisitely soft through the weaving and washing process. And it's what made David Kaufman want to buy and grow the company in 2009. "I put my hand on these fabrics and said, 'Boy, can I do this.' I was struck by the beauty of the product," Kaufman says. A veteran newsman who started his career at CBS during the Vietnam War, Kaufman relocated to Maine in the 1970s for a more predictable life that would give him time to raise a family. Professionally, he focused on managing television and radio stations, at one point owned a marketing firm, and eventually retired in 2005. But the old burn to build something started up again and he spent four years looking for the right business to purchase before a broker brought him the Brahms Mount business to consider buying. Kaufman is the first to admit he's no expert at textile design. "But I like to think I have a good eye," he says laughingly. He also has the touch. When he first felt a Brahms Mount blanket, he immediately knew he needed to be a part of the company's story. Aware of his inexperience in textile manufacturing, Kaufman thought to himself, "Don't screw it up. That's my number one mission." 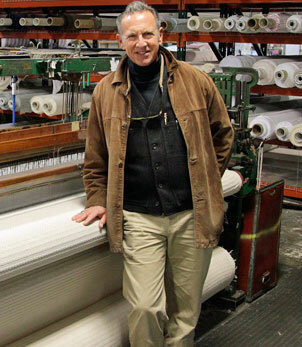 In 2009, Kaufman bought the business from Claudia Brahms and Noel Mount, a married couple who had launched the natural fiber textile brand in 1983. Over the years they had built a reputation for quality, but at the time of sale, were ready to move on to new challenges. When Kaufman bought the company, Brahms Mount had a staff of five working out of a mill in Hallowell on the Kennebec River. It was along this river that Maine established itself as a leader in American textile manufacturing and created a longstanding tradition of weaving heirloom-quality textiles. What came next for Brahms Mount was fueled by a passion for the product and an innate sense of how to build a brand. "When you're a growing company, there is no blueprint," Kaufman says. He started by expanding his team and making Brahms Mount a more regular presence at textile trade shows. That led to an influx of sales, which meant the company had to get organized to meet delivery deadlines. The staff quickly grew to more than 20. Kaufman wooed a former colleague, SuzAnne Brown, to become Brahms Mount's chief financial officer and operations manager two years ago. The two worked together at Harron Communications where SuzAnne was CFO and Kaufman was general manager. "I liked that I didn't have to put on high heels and a suit and silk shirt and pantyhose anymore," Brown jokes of what she left behind of her old corporate existence. Of her new role and coworkers, Brown says: "They're teaching me about weaving and I'm teaching them about organization and system." %VIRTUAL-pullquote-As the company continues to grow, keeping up with production is the biggest challenge.%With Brown in place, the company was set to move into a white Federal-style home on Main Street in Freeport, home of another iconic Maine brand, L.L. Bean. The move helped solidify the company's role in the state's textile manufacturing history and it gave the brand a presence in one of the biggest tourist towns in New England. Around the same time the company overhauled its website, making it far more consumer-friendly and focused on the brand's American-made status. "The last year has been head down and grow," Brown says. In the five years since Kaufman took over, Brahms Mount has grown from five employees to 37 and the brand now is featured in upscale home interiors stores as well beloved on Pinterest. The company also moved from the Hallowell mill to one in Monmouth to improve production time. The move included shifting eight shuttle looms that date back to the 1940s, six of which currently operate, to the new location. "As the company continues to grow, keeping up with production is the biggest challenge," Kaufman says. Looking at the grease-smeared gears of Brahms Mount's 70-year-old shuttle looms, it's hard to believe they produce the pristinely beautiful cotton blankets that can cost more than $600 and are adored by customers. But these temperamental old looms are the heart of the Brahms Mount business. The clanking racket of the machinery helps set the brand apart from blankets manufactured abroad. Yes, it's cheaper and faster to manufacture textiles on the digital rapier looms commonly used in China. Those looms are at minimum three times faster than these decades-old behemoths. But the end result is a dramatically different product. The company's blankets are touched 50 times before they leave the plant. 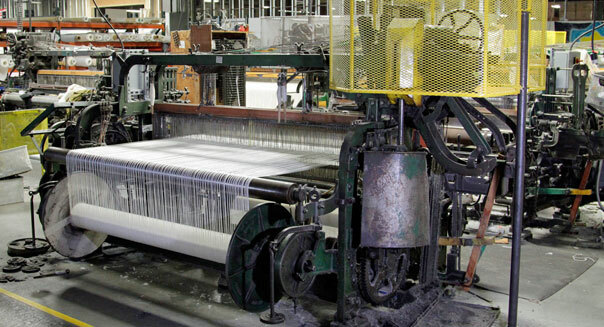 Each yarn in a blanket must be hand-tied to one of the six operating looms. That process alone can take about two hours. Once the yarns are ready to run through the looms, master weaver John Smith attends to each blanket to ensure every fiber is in the right place. With such old machinery, Smith's skill set is critical. The old looms do break on occasion. "They're not easy to keep running because you have to have the parts made," he says. Smith, who studied jazz guitar in college before looking for more practical work, was trained by the original owners. He has carried on their techniques and attention to detail under Kaufman's leadership. "You have to have a lot of patience," Kaufman says of the weaving process and the looms. "Parts will break. They have to be refabricated. It impacts the flow of production, but our customers have been kind to us." The occasional delivery delay is worth it for Brahms Mount customers. But if the beauty of the finished product draws people to the brand, the manufacturing process is really a tale of the Ugly Duckling. What often comes off the looms looks nothing like the finished product. Linen blankets are flat and crispy; the beauty in the patterns isn't always visible. It's the process on a whole -- all those hands on the product -- that work together to reveal the beauty. After blankets come off the looms, they're sent to Daylene Couture's group of washers and finishers. Fibers relax during the washing process and often reveal three-dimensional patters that weren't visible off the looms. Finishers may add fringe. The final product must come close to what design director Jane Laug conceives of on her personal loom in her studio at the Brahms Mount Freeport store. "It's straightforward, it's not overwrought," Laug says of the Brahms Mount look. "Maine is a lot like that. It's a very straightforward beauty." The beauty of the blankets rests on their old-fashioned construction and skills once passed down from father to son and mother to daughter. But like many people growing up in the 20th century, the passage of certain manufacturing skill sets slowed to a halt with Smith. "My grandfather and father used to say you don't have to work like I had to and now I'm working on machines that were from my grandfather's day," Smith says. That's satisfying for Smith, but it's taken him by surprise. After deciding the life of a jazz guitarist wasn't going to sustain him, Smith left college and walked into the Brahms Mount factory with little knowledge of the process. "I knew nothing. I never turned a wrench. I wasn't a mechanical kind of guy," he says. But he took to the work quickly and studied under Brahms and Mount to perfect his weaving technique. It was Brahms who first saw the connection between his jazz guitar training and his passion for weaving and yarn manipulation. Smith attributes his skills to left-hand dexterity. Now he must teach others those same skills if Brahms Mount is going to keep up with its accelerated growth. That's not always easy because of what Smith considers a new American culture of instant gratification. "It's harder to find people who are willing to work their way up," Smith says. "It's hard to build a crew that's willing to do all that learning." It takes Smith and Couture between one and eight months to properly train people to weave and sew. "You don't just find warpers and weavers on the street who are a good match and have the attention to detail we need," Brown says. "We're in an area where there were generations of mills and manufacturers and the shift went to technology. 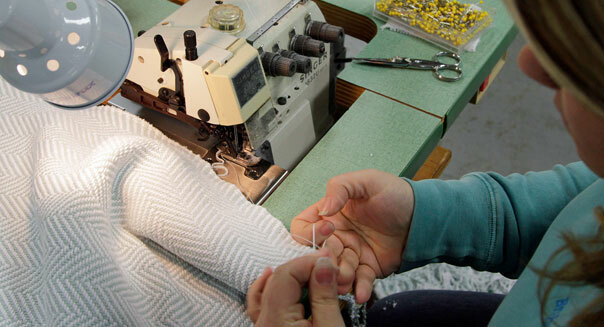 We're trying to find people who are able to sew." Couture depends on her 21 years of experience to train new sewers. "I'm a teacher," she says simply. She's so adept at making blankets that she can spot a "darn," or a missing yarn in a blanket, from across a room. Kaufman boasts that Couture can see what no one else can in a woven pattern. In a small way, Brahms Mount is rebuilding Maine's mill town model where families lived for generations and sons and daughters followed their parents into the mill. This time around, the children are doing it because they want to, not because they have to. Couture's daughter, Brittany St. Laurent, 24, works in the shipping department. Kaufman's son, Aaron, joined the company in 2012 as a project manager and is learning the business. "He comes at things differently," says Kaufman of the value his son adds. With his son back home after years away, Kaufman is enjoying the benefits of the mill town model as well. After a day at the factory, he's off to take care of his two-year-old grandson. "I take my moments when asked," he says smiling. "You have an opportunity to stay in the community where your family is, where you can raise your family with grandparents," Brown says of what Brahms Mount is building in Maine. "To stay local is an advantage a lot of people don't get." For more Made in the U.S.A. stories, go to This Built America.